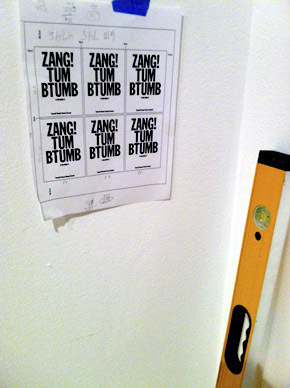 In 2012, curator Laura Hoptman invited us to participate in Ecstatic Alphabets / Heaps of Language, an exhibition on the subject of art and language, taking place at the Museum of Modern Art (MoMA) between May 6 and August 27 of that year. The exhibition consisted of two parts – a historical section, consisting of an abbreviated timeline of language-based modern art, and a contemporary section, featuring a selection of 12 contemporary artists (including us). 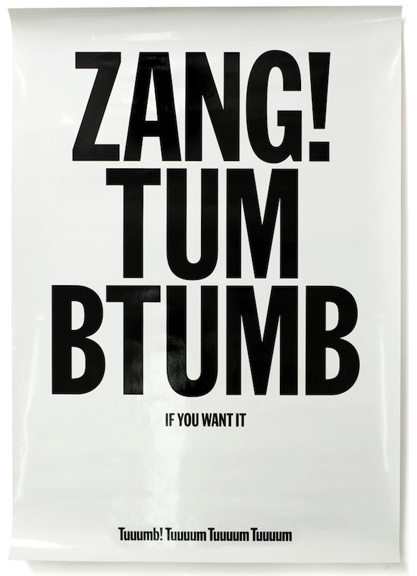 Discussing the subject of the exhibition with Laura Hoptman, it was clear to us that she was very interested in showing Zang Tumb Tumb, a print we originally designed in 2003, for a very specific context. In short, ZTT was a poster we created as a contribution to a group show that took place in Barcelona, in which the invited designers were asked to show their influences. In our poster, we tried to synthesize two seemingly opposed poles of the modernist spectrum: F.T Marinetti’s pro-war sentiments, as expressed in his novel ‘Zang Tumb Tumb’ (1914), and John Lennon and Yoko Ono’s anti-war message, as apparent in their ‘War is Over’ poster campaign (1970). By forcing the words of Marinetti in the lay-out of the iconic ‘War is Over’ poster (thereby distorting Marinetti’s phrase from ‘Zang Tumb Tumb’ to ‘Zang Tum Btumb’), we tried to ‘short circuit’ two of our main influences: Futurism and Fluxus. This was our original proposal for Ecstatic Alphabets. In brief, the piece would have been a mobile, consisting of sheets in various ‘A-formats’ (ranging from 2A0 to A4). 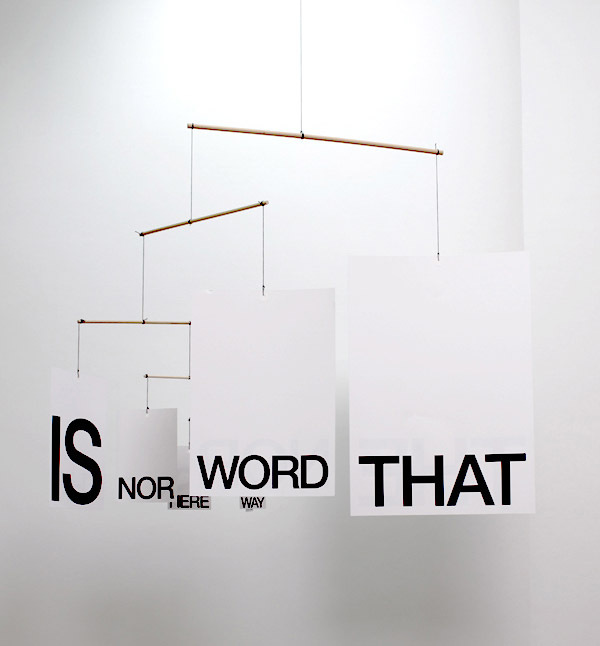 On one side, the series of sheets would carry the sentence “The way is nor this nor that”, which is a quote from painter/poet Brion Gysin (1916–1986). On the other side, the sheets would show a sentence we wrote ourselves (“The word is nor here nor there”). 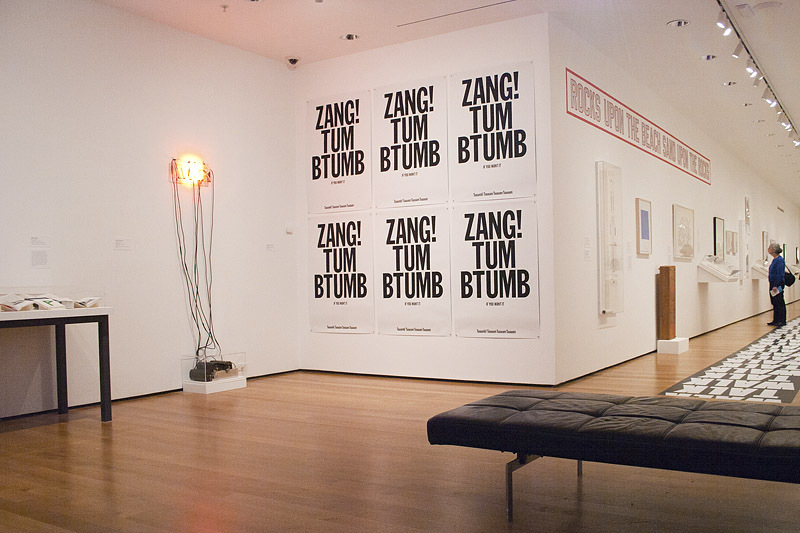 The way we envisioned it, the mobile would work as a random generator of sentences (not unlike Gysin's computer-permutated poem “Junk is No Good Baby”, from 1960). Mounted next to our poster wall was a neon piece by Bruce Nauman, ‘Raw War’, from 1970, thematically ‘rhyming’ with our posters. ‘Ecstatic Alphabets / Heaps of Language’ took place between May 6 and August 27, 2012, at the Museum of Modern Art, New York City. A catalogue, edited and designed by Dexter Sinister and including an image of the original 2003 ZTT poster, was published by Sternberg Press and The Serving Library (ISBN 978-3-943365-18-4). 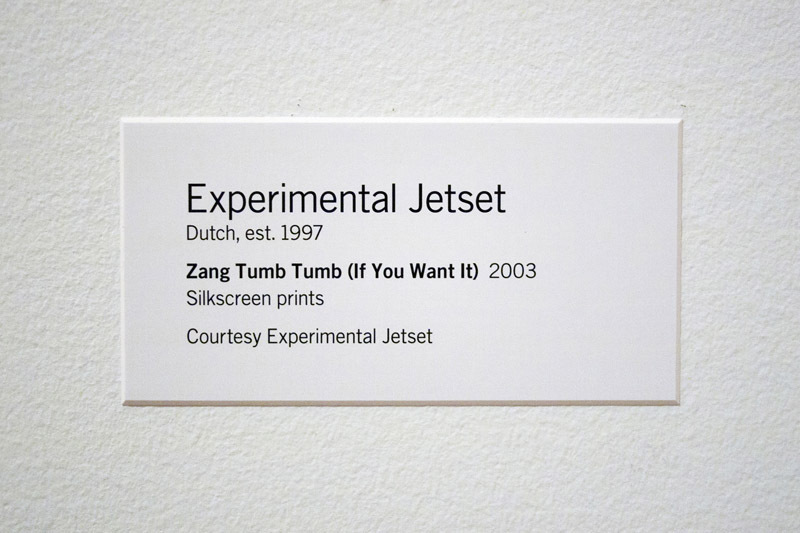 The MoMA also published a postcard, carrying a photo of the original 2003 ZTT print. MoMA featured the exhibition on their website here, while there is also a 'mini-site’ for the exhibition. We’d like to thank Laura Hoptman, Eleonore Hugendubel, Elizabeth Henderson and Yasmil Raymond. The A0-sized reprints were screenprinted by Wyber Zeefdruk in Amsterdam. 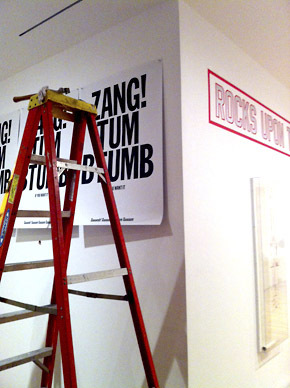 These A0-posters were later acquired by the MoMA, for inclusion in their permanent collection. A list of other work, acquired much earlier (in 2007) by the museum, can be found here.